Given the background information of the previous lesson, let’s take a visual look at how the JVM stack and stack frames work by going back to our recursive sum function from the previous lesson. 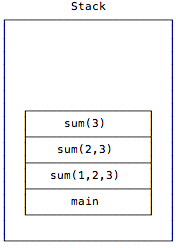 Before the sum function is initially called, the only thing on the call stack is the application’s main method, as shown in Figure [fig:mainOnStack]. Then main calls sum with List(1,2,3), which I show in Figure [fig:firstSumCall] without the “List” to keep things simple. 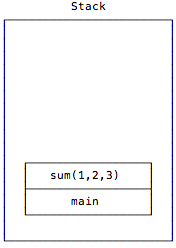 Next, when a new instance of sum is called with List(2,3), the stack looks as shown in Figure [fig:theSecondSumCall]. 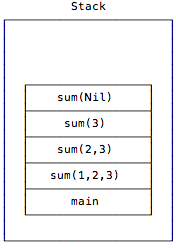 When a new instance of sum is called with the input parameter List(3), the stack looks like Figure [fig:theThirdSumCall]. Finally, another instance of sum is called with the input parameter List() — also known as Nil — and the stack now looks like Figure [fig:theFinalSumCall]. 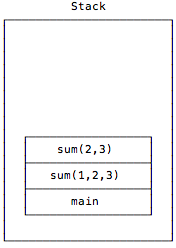 That pattern match causes this sum instance to return 0, and when it does, the call stack unwinds and the stack frames are popped off of the stack, as shown in the series of images in Figure [fig:callStackUnwinding222]. I hope that gives you a good idea of how recursive function calls are pushed-on and popped-off the JVM call stack. Clearly the sum function is being added to the stack over and over again, once for each call. I encourage you to try this on your own to become comfortable with what’s happening. I hope this little dive into the JVM stack and stack frames helps to explain our current problem with “basic recursion.” As mentioned, if I try to pass a List with 10,000 elements into the current recursive sum function, it will generate a StackOverflowError. Because we’re trying to write bulletproof programs, this isn’t good. Chapter 5 of Inside the Java Virtual Machine, by Bill Venners is an excellent resource. You may not need to read anything more than the content at this URL. Chapter 2 of Oracle’s JVM Specification is also an excellent resource. 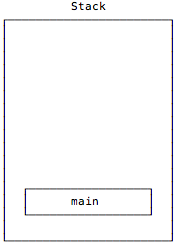 This article titled, Understanding JVM Internals on cubrid.org is another good read. If you want even more gory details, an article titled, Understanding the Stack on umd.edu is excellent. Here’s an article I wrote about the differences between the stack and the heap a long time ago. According to this Oracle document, with Java 6 the default stack size was very low: 1,024k on both Linux and Windows. When I do this on my current Mac OS X system, I see that the ThreadStackSize is 1024. I dug through this oracle.com documentation to find that this “1024” means “1,024 Kbytes”. That command sets the stack size to one megabyte. You specify the memory size attribute as m or M after the numeric value to get megabytes, as in 1m or 1M for one megabyte. Use g or G to specify the size in gigabytes, but if you’re trying to use many MB or GB for the stack size, you’re doing something wrong. You may need this gigabytes option for the Xmx option, but you should never need it for this Xss attribute. The Xss option can be helpful if you run into a StackOverflowError — although the next lesson on tail recursion is intended to help you from ever needing this command line option.